Ron has designed thousands of wedding cakes in his career. He has his formula for a consultation and designing a wedding cake. Some of our clients sit at our table and want everything on their cake. And then we have some clients that take the less is more approach. 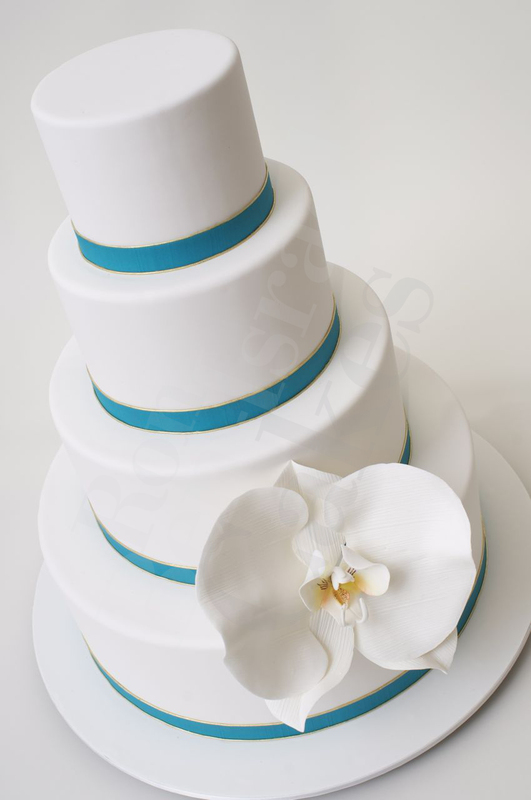 Sometimes designing these kinds of cakes are a bit more difficult because of all the blank space. A little pop of color in the confectionary textured bands and a strategically placed oversized flower can be an amazing work of art. Our friend Eyal Tessler of In Any Event brought his clients' Sara & Kevin in for a design session with Ron. Through discussing their receptions design elements, this is the creation Ron came up with. Their wedding reception was at one of my favorite venues, 620 Loft & Garden, a beautiful event space that overlooks Rockefeller Center. Heavens! How huge is that orchid! Amazing! ← Did I really just say that??? ?